The Royal College Dias – guitar or vihuela? At the end of April 2003 I received from Jose Romanillos and Marian Harris Winspear a truly precious gift – their latest book The Vihuela de Mano and the Spanish Guitar(1). It was both a fascinating and inspiring experience to read through remarkably detailed historical accounts of examination certificates, workshop and collection inventories, lists of public sales of instruments and tools etc. Those of particular interest to me date from the last quarter of the 16th – first quarter of the 17th century. Here vihuelas and guitars are often linked together. The Certificate of exmination of Juan Rodriguez of 27 December 1578, for example, tells us that he was examined “… in the making of a vihuela with a sunken rose and a guitar in the same manner …” and the Declaration … about the examination of Francisco de Lipuste of 26 August 1619 commits that “…one instrument which at the moment is strung as a guitar but was constructed by Francisco de Lipuste as a vihuela; it is, at present, strung as a guitar to make it easier for … Francisco de Lipuste to sell …it …”(2). The arrival of this book also coincided with the start of my new vihuela project. Having made flat-back vihuelas before I was thinking of taking the plunge into fluted-back design … Purely intuitively I was drawn to the beauty of the Belchior Dias 1581 guitar: every part of it, apart from the soundboard (which is a later replacement), looked not only a masterpiece of design but also the highest manifestation of the luthier’s craft(3). It also seemed an exciting challenge to conquer the rather tough art of rib bending. My reasoning then was rather simple: if vihuelas and guitars were constructed alongside (as is witnessed in the historical accounts) and even changed one into the other by mere “re-stringing”, why could I not simply base my vihuela design on the Belchior Dias guitar? At the time I wasn’t even remotely aware that it could be anything other than a guitar. The fact that the Belchior Dias instrument is a guitar is so firmly established that I never even questioned this. References to this instrument as a guitar in numerous books, articles and on the drawing (which was released by the Royal College of Music in 1976) seemed to be overwhelmingly convincing. While the volume of the musical instrument’s body, with the amount of air enclosed in it, largely affects the body’s lowest air resonance frequency (so-called Helmholz resonator), the string length will define the maximum absolute pitch to which the instrument can be tuned. These two parameters, or rather their correlation, determine, in most general terms, the output of specific frequencies in the sound of the musical instrument, the “frequency curve” of its spectrum. The consistency of this correlation is particularly notable within the individual members of plucked and / or bowed families of musical instruments (those of the viol or guitar, for example). It turns out that the string length to body volume ratio of the Dias is, on average, 2.5 times higher than it is for the other surviving instruments which are chronologically close, most notably the anonymous vihuela E. 0748 from the Cite de la Musique Paris, the Quito vihuela and the c.1590 guitar from the former collection of R.Spencer. The last is believed to be made by either Belchior Dias or some other maker of his time. 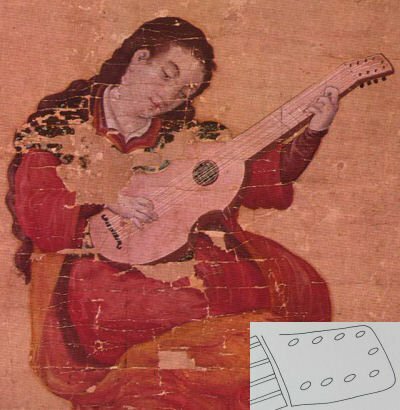 The earliest surviving 5-course guitars mostly have rather deep bodies and hence their string length to body volume ratio is considerably lower than that of the Dias. Owing to the scarcity of surviving instruments, at the current stage of the research, one can only guess if the way the Dias instrument was designed was reserved, at the time of the advancement of the guitar in the 1580s, solely for the construction of vihuelas. The main implication of this design is a rather noticeable boost in the mid-range frequency response and this could well be reserved to serve a specific purpose – for playing polyphonic music for example. On the other hand, guitars, as the surviving instruments demonstrate, were being made with proportionally larger and deeper bodies – a feature that seems to be inherent to their construction from the early 17th century onwards – and which results in a more ‘boomy’ quality of sound. Could such a discrepancy in the design parameters between the Dias and the anonymous E. 0748 vihuela be an indication that the latter was constructed for a different musical purpose, i.e. mainly as an accompanying instrument, for a chordal or even strummed style of playing? Or does it belong to a later period of the vihuela making tradition (early 17th century) when the vihuela and the guitar started to share similar acoustical principles in their construction, as seems to be the case with the Quito vihuela? For the time being there is simply not enough information to answer these questions conclusively. The next step in my exploration of the Dias was fairly logically centering around one of the most intriguing features of its construction – the presence of 11 peg holes in its peg head(plate1, first left). One of the holes is positioned just behind the nut, along the centre line of the peg head, at the same distances from the pegs above it as that in-between the rest of the pegs. Also the axis of this central peg hole appears to be noticeably tilted from the rest of the pegs towards the rear of the neck, providing some extra space for gripping the peg while tuning. Thus, the peg head layout seems to have been provisionally planned for the housing and functioning of this additional peg. There is also a noticeable lengthening of the peg head on the stretch between the back of the nut and the first pair of pegs. This distance is even slightly larger (in this case 28 mm) than the average amount (c. 25 mm) for a “full size” five-course guitar (I would assume with 69 – 72cm string length). One of the most striking comparisons here is with the Iberian c.1590 guitar which may well have been made either in the workshop of Belchior Dias himself or another maker who was closely associated with the guild of Portuguese violeros of the time: with clearly a defined peg head layout for five double courses this distance amounts to only 19mm(4). From the face side of the peg head the hole appears to have what looks like worn degraded edges, encompassing part of the triple ornamental purfling and causing its partial damage. At present all the peg holes are reamed to accept disproportionably large-sized pegs, either from the time of the instrument’s last conversion in the late 18th century (both the bridge construction and the style of mustachios are rather typical for the French guitars of the time) or even later. This procedure of re-reaming could well be one of the most likely causes of the breakage of small parts of the veneer on the face side of the peg head as well as neighbouring parts of the purfling (there is a similar sort of veneer breakage next to one of the other peg holes). The original diameter of the pegs would have been at least c. 1.0 to 1.5 mm smaller than those that are presently in place (they look disproportionably large against the instrument’s peg head). But how likely is it that this hole remained there from the time of the instrument’s creation? Can it be the result of conversion or some other reason yet unknown? Is there supporting historical evidence to justify the 11-string vihuela? And if it is indeed a 6-course 11-string instrument, how can one reconcile this arrangement with the rather shallow neck and corresponding limited span (at least by today’s standards) between strings and courses on the nut and bridge? Our present day judgements on these matters are largely based both on the available information (surviving instruments, written sources and iconography) and, quite rightly so, on our own experiences. As for the string spacing for example, makers do whatever players ask of them. The setting-up parameters of a modern reproduction of the vihuela virtually replicate those of the Renaissance lute and with the most demanding vihuela repertoire still waiting to be played, explored, not to mention recorded (the music of Fuenllana for instance), we still remain outside understanding how the early makers approached the set-up of their vihuelas. Plate 1. Peg heads with nine and eleven arrangements of pegs on (from left): Belchior Dias 1581 guitar (?) – vihuela (courtesy of the Royal College of Music, London); Italian (?) early 17th century guitar (?) – vihuela; 5-course guitar, Italy, 1st quarter of the 17th century; 5-course guitar on the painting (1630s – 1650s) of Jean Daret . First of all it does not seem that there exists any reasonable explanation as to why the central peg hole on the Dias should be treated as merely “unoriginal” or not even regarded as a peg hole. Moreover, suggestions that it is simply there for a purpose like hanging the instrument on a nail in the wall or letting the strap through do not seem to have any sound reason behind them. 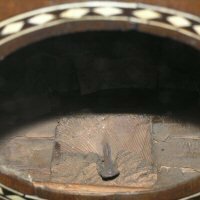 There are, in fact, similarly positioned holes in other surviving instruments as well as in those shown in the early – mid 17th century iconographical sources (more about this below). On a serious note, holes at the upper edge of peg heads of early guitars were, in a way, serving for a strap and / or ribbon bow tie attachment. They were usually made in smaller diameters than peg holes, with no concern for the distances from the neighbouring pegs, as they wouldn’t need a functioning peg in. In fact, there is already such a hole at the upper edge of the Dias instrument’s peg head which was most probably made there by the maker himself for no other purpose but housing a strap pin(5). So this existing hole could easily have been increased in diameter if the use of a pin was not chosen as an option. I would really find it difficult to think of any reasons for going to the trouble of making another hole just to attach a strap in such an awkward, for this particular purpose, place. I want to stress again that in the case of the Dias instrument the central hole going through the neck / peg head V-joint is positioned at exactly the same distance from the two pegs above and, in turn, equals the spacing in-between the other pegs. It is executed with the tolerance level very much in line with the rest of the instrument (there is often a “touch” of imprecision in the work of early makers; they did not seem to bother very much about accuracy as we do nowadays). The same reasoning on ruling out “unoriginality” of similarly-positioned peg holes applies to the other two surviving instruments on which this feature is also present (Plate1, second & third from left). It is also worth mentioning that neither on the Dias nor in the two other cases are there signs of alterations of any sort pointing at a possible conversion, for example, to a chitarra battente – one other common reason for the presence of additional peg holes in peg heads of surviving early guitars. If this were the case, there should have been at least one (in case of the Dias and the V&A instrument) and three (in case of the Italian five-course nine-string guitar) more additional peg holes. As for the string spacing it is possible to gather some evidence on a number of surviving lute family instruments and, most importantly, guitars of Iberian origin with the bridge (and, in rare instances, nut) string spacing close to the necessary figures to satisfy a 6-course arrangement on the Dias. In practical terms, this would mean placing the outer strings of the courses at about 37 – 38 mm at the nut and 55 – 56 mm at the bridge. Frightfully small figures in comparison with the standard set-up of the lute! 1). 14-course archlute by M. Sellas, Venice 1639, string length 56.5 / 83cm, Witten collection, USA. Distance between the outer strings of the 1st and 6th double courses 58mm (56mm imagining that the first string is single and positioned in the middle of the two strings of the 1st course). 2). 14-course theorbo by V. Venere, Padua 1611, string length 75.9 / 120.5cm, Vienna KHM, Inv. No C47. Distance between the outer strings of the 1st and 6th double courses 58mm (56mm imagining that the first string is single and positioned in the middle of the two strings of the 1st course). 3). Chitarrone by Magno Tieffenbrucker, Inv. No 26, Royal College of Music. Distance between the outer strings of the 1st and 6th courses 56.5mm. 4). 13-course lute by S. Schelle, Nurnberg 1726, string length 65.2 / 71.5cm, Jale University, Inv. No 260. Distance between the outer strings of the 2nd (single) and 7th courses 58mm. 1) 6-course lute by Magno Dieffopruchar, c. 1550; Collection of Charles Beare, London. Width of neck at the nut 41mm, distance between the outer strings c. 36mm. 2) 6-course lute by Georg Gerle, c. 1580; Kunsthistorisches Museum, Vienna, No. A35. Width of neck at the nut 42mm, distance between the outer strings c. 37mm. 3) 7-course lute by Wendelio Venere, 1592; Academia Filarmonica, Bologna. Width of neck at the nut 45.6mm, distance between the outer strings of the first and sixth courses c. 36mm. 4) 7-course lute by Giovanni Hieber, c. 1580; Muziekinstrumenten museum, Brussel. Width of neck at the nut 50.5mm, distance between the outer strings of the first and sixth courses c. 38mm. Some surviving guitars of Iberian origin display rather tightly spaced courses on their bridges, among these are: an anonymous Iberian 5-course guitar c.1740 – 50 from the Edinburgh University Collection(7), six-course guitars by Juan Pages 1803 and Lorenzo Alonso (8), Madrid 1786 (9). The values of string spacing of the J. Pages guitar are particularly notable in this respect: with the string length of 66cm (10cm more than on the Dias) the outer strings are 57mm apart on the bridge (assuming that the first course is single) and the distance between pairs of strings in courses are in the area of 3.0mm – 3.5mm. Lorenzo Alonso’s guitar has a 61.5cm string length (5cm more than on the Dias) and the outer strings of its double courses on the bridge are not further than 54mm apart and at the nut 39mm (or 38mm assuming that the first string is single). The distances between strings in courses are again rather small, about 3mm or even less. The string length of the 5-course Iberian guitar from the Edinburgh University Collection is only a fraction smaller than that of the Dias and the distance between the individual courses on the bridge are from 11 to 12 mm. One other feature that seems to be characteristic for these three instruments is that the outer strings of the first and sixth courses are positioned fairly closely to the fingerboard edge, (c. 1.0 – 1.5mmm at the nut end). On the J. Pages’s guitar the fingerboard edge in the area of the first few frets have worn so much that it is virtually impossible to finger the outer string of the first course without slipping over the edge of the fingerboard! In some cases, the outer string spacing on the bridges of surviving 6-course mid -18th century Italian mandolinos reveals even smaller figures 49.5 – 51 mm, although occasionally they reach as much as 60 – 62 mm. For the comparatively shorter string length (c. 31cm on average), this variation is quite considerable and may reflect makers and / or players regional preferences (for example, Milan as compared with Naples). The distance between strings in courses at the bridge is, as a rule, about 2 mm. All this evidence may not seem exactly relevant, as it comes either from instruments belonging to different families (lutes, mandolinos) or later specimens. Nevertheless, I still think it can serve as a starting point to re-evaluate often rather subjective conclusions on these matters. These results are only a small fraction of what can be gathered and analysed but they do already show figures that are pretty close to what would be required for a 6-course arrangement of strings on the Dias instrument, with at least 11mm apart in-between courses on the bridge and about 7.2mm at the nut. Whether a modern reproduction of the vihuela with this sort of spacing would be playable for the modern day vihuela enthusiast is a totally different matter altogether (10). Although iconography can not be used to provide the exact values of such parameters as string spacing, we can still get an idea of how narrow the string band looks on some surviving representations of the vihuela. One gets the impression that the strings run virtually parallel from nut to bridge. It is worth mentioning in this connection the occurrence of chords in high-up positions as well as those with simultaneous stopping of two adjacent courses with one finger in the vihuela books. So closer placement of courses both on nut and bridge could indeed be one of the characteristic features of historical vihuela construction (11). However, the figures suggested above should not be perceived as an attempt, as it concerns the spacing values on modern reproductions of the vihuela, at any sort of sweeping generalisation. For example, from a fairly large number of surviving lute family instruments we can learn that string spacing on both nut and bridge can noticeably differ even within, say, representatives taken from the relatively short periods of their existence. Therefore it would not be unlikely to presume that this was also the case with the late 16th – early 17th century vihuelas. 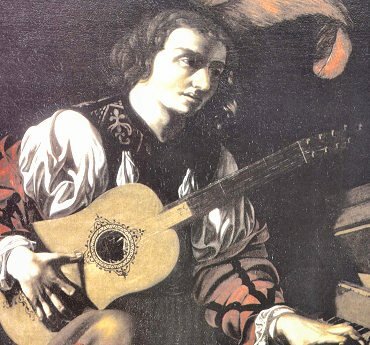 The most striking piece of pictorial evidence showing a similar arrangement of pegs as that on the Dias, except in this particular case on a five-course guitar, comes from the remarkably detailed painting by Jean Daret (dated around 1640s – 50s) (plate2). The chronological span between the date of the Dias instrument manufacture and the painting should not be reason to dismiss this evidence. Quite the opposite, we should not forget that the baroque guitar directly inherited most of the organological, stylistic and constructional features of the vihuela, of which a flat-shaped peg head is one of the most obvious (12). 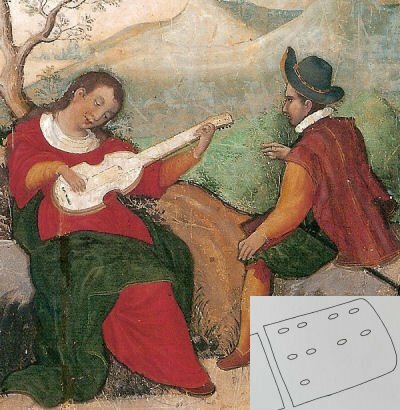 The fact that the 5-course guitar seems to ‘re-appear’ in early 17th century Italy as a fully developed instrument shows all too clearly that it had its prototype in the earlier Spanish guitars and, very likely, ‘re-converted / adopted’ vihuelas (see, for example, the above-mentioned account of Francisco di Lipuste of 1619). Additionally, there seems to have been well-established trades in this area (as is evidenced in the 1575 account of the workshop content of the violero Mateo de Arratia of Toledo (13), for example, which lists “eighty-eight tops from Venice with roses …”) and they could have laid the ground for adaptation and exchange of constructional ideas back from the mid-16th century or even earlier(14). Plate 2. “Portrait of an artist and guitarist” c.1630s – 1650s by Jean Daret (Musée Granet, Palais de Malte, Aix-en-Provence). The depicted guitar could be one of the re-converted early 17th century eleven-string vihuelas: there is enough space at the top of the peg head for two extra pegs. 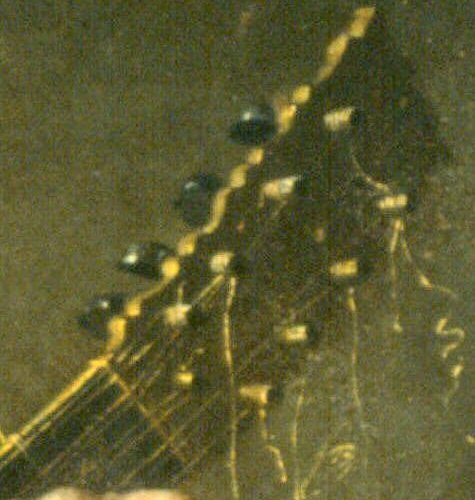 Note also that the neck is long enough for twelve frets (ten frets are shown on the painting); this is rather unusual for a 17th century 5-course guitar. The painting of Daret along with the other iconographical evidence and surviving instruments that I was able to gather up to the present day (and I’m sure that there is more evidence still to come / find) also prompted me to look in a different light at some written historical sources that mention the exact numbers of strings. They were all quoted over the years by different authors, notably in two articles by Antonio Corona which were published in The Lute magazine in 1984 and 1990. These passages were mainly referred to in relation to the ways of stringing the vihuela and the guitar. But apart from stringing the wording of those sources can also signify the actual, maximum number of strings that those instruments could be strung with, in other words pointing out their distinctive organological feature – the presence of odd rather than even numbers of pegs on their peg heads. What seems to emerge from the sources that I am going to go into more details about below is that the nine- and ten-peg arrangements on the flat-shaped peg heads of five-course guitars during the late 16th – early 17th centuries seem to have been shared, as a purely specific constructional feature, with the contemporary vihuelas (or indeed vice versa) resulting in eleven- and twelve-peg arrangements on their peg heads. For some reason those with an odd number of pegs (judging at least from what is evident from the iconographical sources and surviving instruments of the time) are infinitely rarer: for what particular reason, we are yet to ascertain. A number of early 16th century iconographical sources show instruments which can equally be qualified either as viola da mano or vihuela. Their main difference is in the shape of the body which appears to have either a c-shaped (cornered) or incurved waist but such features as peg head construction and the number of pegs seem to have been shared by both types. On some of the well-known depictions of such instruments their peg heads are clearly shown and the number of pegs can be exactly counted. This number is predominantly either nine or eleven for five- and six-course instruments accordingly. Those depictions are: Anonymous (Sardinian school), Madonna and child with angels musicians, c.1500 (Castelsardo) – 9 pegs; Bernardino Pinturicchio, fresco, c.1492 (Rome, Vatican) – 11 pegs? ; Luca Signorelli, Coronation of the elect, c.1500 (Orvieto Cathedral) – 9 pegs; intarsia door in Palazzo Ducale, c.1507 (Mantua) – 11 pegs; Anonymous fresco, Santa Maria della Consolazione, c.1503 (Ferrara) – 11 pegs; Girolamo di Libri, Madonna and child with saints, c.1520 (Metropolitan Museum of Art) – 11 pegs. What all these instruments also have in common is a viol-type peg head construction (lateral pegs) ending either with a scroll or animal head. Two rather unique illustrations of Japanese origin have survived that were supposedly painted by the students at the Jesuit schools – institutions founded there by European traders in the mid-16th century(15). In fact the depicted instruments probably date to the early decades of the 16th century, therefore providing, in minute details, a rare insight into early viola da mano and vihuela organology. Both of them have a nine-peg arrangement on a flat-type peg head (rear pegs). One of the paintings shows a central peg which is positioned at the top end of the peg head (one can clearly see the string line feeding on to it), while the other has a single peg on the right side of the peg head, in vicinity of the nut (Plate3)). So what we have here is the odd peg number configuration transferred from a viol- to a flat-type of peg head construction. Plate 3. Vihuela da mano or vihuela, c.1590s, Japan, (collection of the Yamato Bunka-kan in Nara). The drawings in the bottom right corners of the pictures show positioning of pegs on the peg heads of the instruments*. 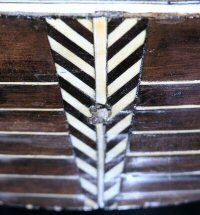 Also note that the sides of one of the depicted instruments (left picture) seem to have been made of whole strips of wood, while those on the other (right picture) consist of three alternating strips: light / dark / light. This feature is still found on some of the surviving French viols well into the second half of the 18th century. * Reproduced, with kind permission of the GENDAI GUITAR Co., from the article “Plucked Instruments in the Iconographical Sources in the 16th Century Japan” by Sumio Omata (Gendai Guitar magazine, issue no.124 March 1977). 1. The recently published illustration of a guitarist, which appears on the cover of the second issue of the Spanish vihuela society magazine Hispanica Lyra (No 2, October 2005). More detailed image of this important painting can be found on their web site – Sociedad de la Vihuela. 2. A rather small sized vaulted-back guitar in the engraving by Etienne Picart (c. 1680) after the painting by Leonello Spada Concert (c.1615), Musée du Louvre, Paris (16). 3. The oil painting “Three Musicians” by Diego Rodriguez Velazquez, c.1616-1620, Gemaldegalerie, Staatliche Museen zu Berlin. To my knowledge this is the only iconographical evidence of the five-course nine-string (peg) guitar originating from an early 17th century Spanish source, the kind of instrument Joan Carles Amat associated with the five-course Guitarra Española (see more about this below) (Plate5). 4. Two oil paintings by Gerrit van Honthorst (1590 – 1656) of a guitar player apparently showing the same instrument. One painting is in Musée du Louvre, Paris, dated 1624; the other in Lviv art gallery, Ukraine, dated 1631. 5. Engraving in J. B. Granata’s 1659 book Soavi Concenti di sonate musicali, opera quarta which shows a guitarist (perhaps Granata himself) with a 5-course, 9-string guitar (17). 6. The quill drawing in Pietro Ricci’s Scuola d’intavolatura …à suonare la chitarriglia spagnuola … Roma, Paolo Moneta, 1677. París, Bibliothèque Nationale, Mus., Rés. Vmf. 35. On this rather unique drawing one can even see the strap tied on to that uppermost peg. The instrument also appears remarkably similar (with a rather deep, vaulted-back body) to that on the engraving by Etienne Picart (see above). 7. Oil painting by Toorenvliet Jacob Leiden (1640-1719), dated from the third quarter of the 17th century, private collection. Also there are at least two surviving five-course guitars which I am aware of, with a similar arrangement of pegs to those that appear in the above-listed iconographical sources (18). Plate 4. 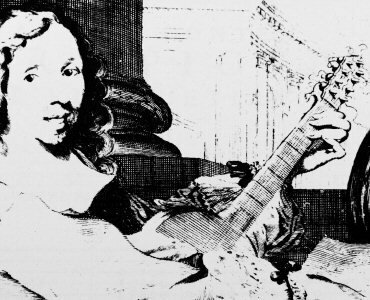 Examples of nine-peg arrangements on a flat-type peg head (clockwise from upper left corner): A. Painting of a guitarist (attributed to Francesco Gentilelschi) from the private collection in Genova, Italy*; B. Engraving (c.1680) by Etienne Picart (1632 – 1721) of the painting (c.1615) by Leonello Spada (1576 – 1622); C. The quill drawing in Pietro Ricci’s Scuola d’intavolatura …à suonare la chitarriglia spagnuola … Roma, Paolo Moneta, 1677 (París, Bibliothèque Nationale, Mus., Rés. Vmf. 35). On this unique drawing one can even see the strap tied on to the uppermost peg. The instrument also appears remarkably similar (with a rather deep, vaulted-back body) to that on the engraving by Etienne Picart (see above); D. Engraving of a guitarist in J. 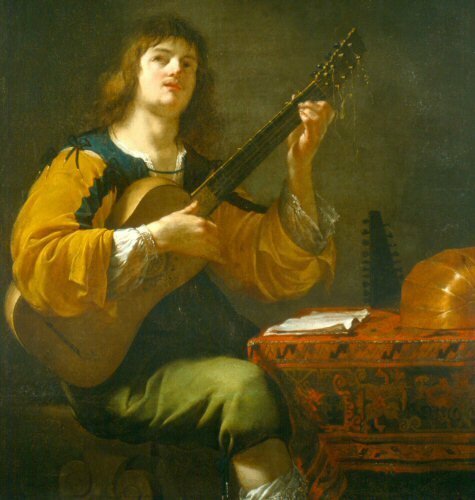 B. Granata’s 1659 book Soavi Concenti di sonate musicali, opera quarta; E. One of two oil paintings by Gerrit van Honthorst (1590 – 1656) of a guitar player apparently showing the same instrument. One is in Musée du Louvre, Paris, dated 1624; the other in Lvov art gallery, Ukraine, dated 1631; F. Oil painting by Toorenvliet Jacob Leiden (1640-1719), third quarter of the 17th century, (private collection). This outline would not be complete without mentioning the four-course seven-string guitar, the surviving illustrations of which, as found in four printed books of music by Guillaume Morlaye and Simon Gorlier published in France in the mid-16th century, show a flat-type peg head with an exactly similar arrangement of pegs (i.e. one of the seven pegs is centrally-positioned at the top edge of it). Pilaster strips of the Santissima Sacramento cappella of the Duomo of Cremona which were designed by Francesco Dattaro in the late 1560s represent a four-course guitar with a flat-type peg head and seven pegs positioned asymmetrically, four on one and three on the other side of it (19). 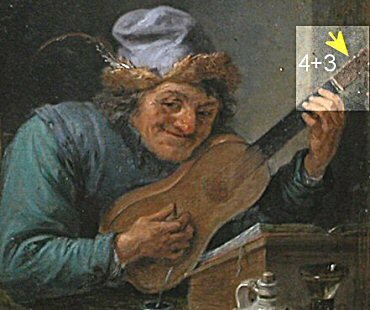 A similar arrangement of pegs on a four-course seven-string guitar is also shown in a self-portrait of David Teniers le Jeune, (1610 – 1690) (to my knowledge the only one of this sort in the available iconographical sources)(20)(Plate5). Two well known illustrations of the four-course guitar, this time with a viol-type peg head: a pen drawing from the manuscript by Jacques Cellier from the last quarter of the 16th century and the engraving in the Pierre Phalese 1570 book of music both seem to imply a seven-peg arrangement (21). 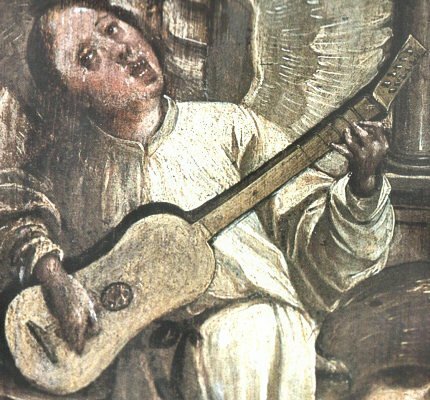 This brings us to a truly unique iconographical source: a mid-16th century painting from the Igreja da Misericórdia in Abrantes, Portugal (Plat6)) shows what appears to be a six-course eleven-string vihuela. In a similar way to the four-course guitars mentioned in the paragraph above (see also Plate 5, left column), the pegs are positioned asymmetrically, five on the left and six on the right side of the peg head. This important evidence demonstrates further that in the mid-16th century the guitar and the vihuela shared similar constructional features and, in a way, complements the words of Fuenllana who, in reference to the four-course guitar in the Prologue section of his Orphenica Lyra (1554), wrote the following: “the four-course vihuela, which is called guitar” (vihuela de quarto ordenes, que dizen guitarra). Plate 6. Anjo com viola, c.1550s (Igreja da Misericórdia in Abrantes, Portugal). *I would like to express my sencere gratitude to Diana Mira (www.pedexumbo.com) for her kind help in obtaining the image of this picture for me. There is an interesting parallel here with an Italian four-course, seven-string instrument called chitarra italiana or chitarra a sette corde (as it is listed under in the 1578 inventory of the two Neapolitan musical instrument makers). The research carried out by Renato Meucci has shown that this was in fact a small lute-family instrument, with a lute-shaped body(22). A later, five-course variety of chitarra italiana appears to have been depicted as a nine-string (peg) instrument with a flat-type of peg head (like that on the guitar) and a lute shaped body on a number of still-life paintings by Bartolomeo Bettera and Evaristo Baschenis dating from the 1660s. One of the pegs is again positioned just behind the nut, along the centre line of the peg head. Whether this constructional similarity was influenced by the five-course nine-string Spanish guitar is difficult to ascertain. What is possible, however, is that the very idea of the Italian chitarra a sette corde was initiated by the then popular four-course Spanish guitar – the presence of which almost seems inevitable in the 16th century Naples bearing in mind its strong political and cultural connection with Spain at the time (note also the above-mentioned representation of the four-course seven-string guitar in the Duomo of Cremona). 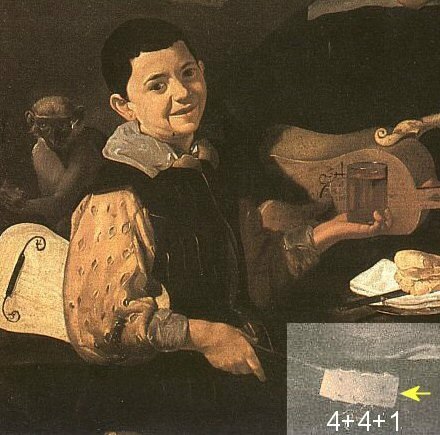 The painting by Jean Daret together with one of the surviving 5-course guitars, most probably from the first quarter of the 17th century which surfaced recently at one of the musical instrument auctions in France are examples of the nine-peg arrangement with one of the pegs positioned behind the nut, in a similar way as is found on the Belchior Dias instrument. The peg head of this rare guitar looks similar to those on the other surviving 17th century Italian guitars, except that in this case only nine pegs are housed in it, with the central one going through the v-join of the neck with the peg head (Plate1, second right). However, there is also one other instrument, this time in the V&A collection, with the number and arrangement of peg holes exactly replicating those on the Dias (Plate1, second left). It seems to have escaped conversion into a chitarra battente, so its neck and peg head joint were not altered. It is identified in the 1968 catalogue of the V&A collection as an Italian mid-17th century guitar (Plate7), on the grounds that there appears to be a similarity of the patterns of its neck marquetery veneer with another guitar in the collection (which is apparently attributed to Matteo Sellas)(23). In fact the presence of the Venetian style marquetery does not even guarantee that it originated from there, for as we now know trade in musical instrument parts between Venice and Spain, as the above mentioned account of Matteo Arratia of 1575 suggests, most probably did take place in the late 16th century. Stripy-like angular ornaments on the face side of the peg head and at the join of the sides at the bottom block look to me stylistically rather at odds with other surviving 17th century Italian guitars. It seems that these features were added by the maker himself while the neck and peg head veneer on the rear were supplied separately (i.e. from Venice). Yet more research has to be done with this instrument in order to pass the final verdict. Every second guitar gets attributed to being Italian made simply either on the grounds of the similarity of its marquetery veneer patterns with one of the labelled Sellas guitars or simply because it carries Venetian style marquetery veneer on its neck or other parts. What we may have here in this V&A instrument however, is an early 17th century vihuela which, unlike the Quito vihuela in Ecuador, is provided with eleven rather than twelve peg holes in the peg head(24). Interestingly enough, there is even a noticeable degree of similarity in the floral-style ornamental inlays of their soundboards (with the exceptions that on the V&A instrument they consist of black paste while on the Quito vihuela – of ebony) (Plate7, two right columns). 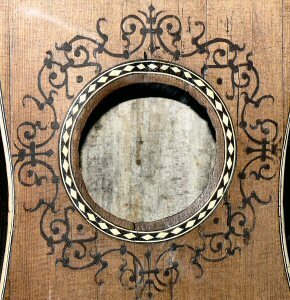 We can also see that the outer parts of the ornamental black paste inlay on the soundboard of the V&A instrument are “cut off” by the soundboard edges – a feature commonly found on many other surviving 17th century guitars and an indication that it may have been manufactured in a different place (i.e. supplied separately) from the rest of the instrument. On the Quito vihuela, however, the ornaments are well within the soundboard edges. Plate 7. Two left columns: Italian (?) 17th century guitar (?) – vihuela, Collection of the V&A museum, London. Two right columns: Floral-style ornamental inlays on the soundboards of the V&A instrument and a 6-course vihuela, first quarter of the 17th century, Quito, Ecuador. Another interesting aspect of this V&A instrument is its integral neck / neck block construction, the extreme end of which extends into the body and is nailed to the wooden block underneath with a single forged nail. This way of construction occurs in other surviving guitars, notably in one of the guitars in the Paris collection (which is believed to be manufactured in Naples) (25), as well as in the other rather remarkable guitar from the Deutsches museum in Munich(26) Unfortunately, the neck and peg head of this last instrument were shortened in later conversions, so we can not be sure of the exact original number of pegs. It does share the integral neck / neck block construction with the other two instruments and, in addition, the ornamental pattern of its rose is based on the same design as that of the rose in an anonymous fluted-back vihuela (Inv No E. 0748) in the Cité de la Musique. Although this all seems a fairly complicated picture and at this time it is not possible to be sure of the exact place of manufacture of these instruments, such places as Spain and Naples are equally possible candidates. Naples, along with Valencia and Madrid, was one of the places where the vihuela was still being played in the early decades of the 17th century. John Griffiths brought some enlightening reflections in this respect on the late days of the vihuela and its repertoire in his report at the Paris symposium in 1998(27). Returning briefly to the V&A instrument once again, I would like to underline that the positioning of the central peg hole is again very precise, with the clear view of placing a functioning peg there. Those 17th century guitars that were converted to chitarra battente are often provided with additional pegs which create a rather crowded peg environment (as is found, for example, on one of the other highly decorated guitar from the V&A collection – the one with matching veneer patterns to the instrument under discussion). Looking at the top end of the peg head of the depicted guitar on the painting of Daret one can almost see that there is enough space available for two extra pegs which are not there for the reason, may I venture to assume, that this guitar could be one of the re-adopted early 17th century vihuelas, similar in size to the Quito and V&A instruments. 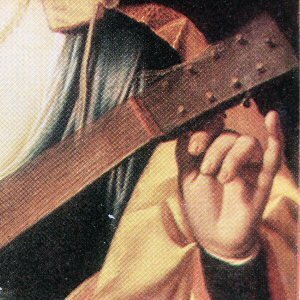 Another feature worth mentioning in this context is that the neck of the guitar on the painting of Daret looks rather long for a typical guitar of the time – with the ten frets already placed on it there is still enough space for another two (Plate2). As for the written sources, Amat in his Guitarra Espanola (the earliest edition of which dates to 1596) makes it all very clear saying that “the five-course Spanish guitar … has nine strings in all, one on the first course, called first, and two on the other courses …” (Esta Guitarra Española de sinco ordenes està compuesta de nueve cuerdas: una el en orden primero, llamada prima, y en los demas ordenos dos, …)(28). Note that Amat did not say that it has ten strings but was strung with nine! Further on, in a chapter dedicated to the instructions on how to adapt the five-course chords for a four-course guitar, he mentions “which is the one with seven strings” (que es la de siete cuerdas)(29). This coincides rather well with other references to the four-course guitar as being a seven-string instrument(30). In addition, the available pictorial representations I mentioned earlier show that it was also provided with seven pegs. So could it really follow from the Amat’s reference to the five-course guitar as being a nine-string instrument that it was provided with nine pegs? Unfortunately we have hardly any surviving 5-course guitar(s) from the late 16th – early 17th century Spain and only a few paintings from the early decades of the 17th century which clearly show arrangement of pegs on the peg heads of depicted guitars. There is almost a universal agreement, largely based on the surviving 17th century Italian and French guitars and mid – late 17th century iconography that the five-course guitar (la guitarra spagnuola) is supposed to be provided with ten pegs. But the fact is that we do not really know which particular peg configuration was more widespread in the preceding century in Spain: with nine or ten pegs. What is not excluded, however, is that the early models of the five-course guitars (from c.1580s onwards) could fairly logically have been replicating certain constructional features (i.e. odd peg number configuration) of the seven-string four-course guitar(31). What also seems to be remarkable in this context is that the earliest surviving representations of the five-course guitars to date (see the list above) show the nine-peg arrangement! In this light the above-quoted passages from the Amat’s method could well indeed mean that he was referring to guitars which were provided with nine (five-course) and seven (four-course) pegs. The inventory of goods (dating 1591) left by a lady from Barcelona lists: (there are) three viols, one of nine strings … one of eleven strings and the other one bowed. This particular account is quoted in A. Corona’s 1990 article in “The Lute” magazine and which the author interprets as “five- and six-course vihuelas”(32). What is more likely though, is that the three viols in this particular context should more appropriately be interpreted as: a guitar (nine strings), a vihuela (eleven strings) and a viol or, indeed, violin. Also, for the rather late dating of this account a five-course, nine-string vihuela would be rather anachronistic. More importantly, what is also not excluded here is that those instruments could have been provided with nine and eleven pegs (corresponding with the maximum number of strings that they could accept). From the assertion that the first course on both the vihuela and the guitar was single, as Sebastian Covarrubias Orosco has stated in the entry on the guitarra in his Tesoro de la lengua Castellana o Espanola (Madrid, 1611), it does make more sense to expect for the account of this sort to describe the physical characteristics of the instruments rather than the mere ways of stringing 33. So perhaps an alternative reading, by substituting strings for pegs, could equally be justified. 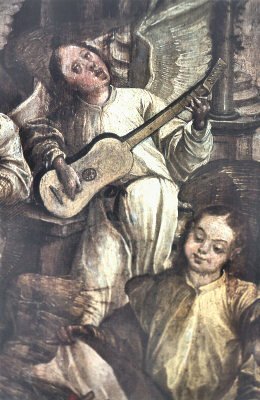 In fact, the depicted vihuela on the painting from the Igreja da Misericórdia in Abrantes (Plate6)) serves as a perfect illustration to the eleven-string viol[a] that is mentioned in this account. The inventory of the Parisian instrument maker Philippe de La Canessière (1551) lists: Item, troys guiternes dont une a unze cordes et les deux aultres petites(34). The eleven-string guiterne in this particular context can signify either a six-course vihuela or viola da mano both of which could have resembled, at least in their appearance, for the compiler of this account the then popular in France four-course guitar (in fact, les deux aultres petites could well refer to four-course guitars). As far as I know neither iconographic nor written sources have yet been looked at from the perspective of an alternative arrangement of pegs (in odd numbers) on the late 16th – early 17th century guitars and vihuelas and this might be the most likely reason why the eleven-peg (hole) feature of the Belchior Dias instrument has escaped the attention it deserved for so long or was simply treated as “unoriginal”. With all the above considerations in mind, the overall picture appears to me like this: Although most of the five-course guitars were provided with ten pegs – a fact that is evidenced from the surviving instruments and available iconographical sources from the early 17th century onwards – guitars with only nine pegs were also being made, albeit in a smaller quantity(35). This rather subtle but nevertheless important, in the context of the present study, organological distinction was most probably also present in the guitar’s closest historical relative – the vihuela (and, in the earlier part of the 16th century, the viola da mano) resulting in eleven, as opposed to the more common(?!) twelve number of pegs. The most likely cause for this sort of ‘double standard’ could well be initiated by the way of stringing the vihuela and the guitar with a single first course. The seemingly more preferable even number twelve-peg arrangement on a six-course vihuela (as is evident from the available iconographical sources) appears to be related to the inherent to its construction flat-type peg head with symmetrical positioning of pegs, no matter if one of them was left unused. At the same time, vihuelas with viol- and lute-type of peg heads may have been provided with an odd number of pegs (nine and eleven for five- and six-course instruments accordingly), as seems mostly to be the case on the contemporary viola da mano. Why was there indeed such a dichotomy? If the most common way of stringing the guitar and the vihuela was with a single first course, why was there a need for an extra peg? The Quito vihuela is, in a way, a living proof of this: with twelve holes for pegs in its peg head only eleven strings can be accomodated in the bridge slots. Perhaps the use of the first double course was preferred in some particular musical context and / or the style of playing, such as accompaniment or rasgueado? Could this be the reason why the ten-peg configuration became an inherent constructional feature of the 17th century Italian (and, later in the century, French) five-course guitars and remained so ever since. Or was it simply a matter of design, with the aim of achieving symmetry in the arrangement of peg holes and leaving more place in the middle of the peg head for placing an ornament and / or maker’s label(36)? 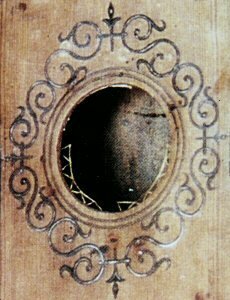 Most surviving Italian and French 17th century guitars have, as a rule, either one or both of these features (a single peg hole in the middle behind the nut or at the farther end of the peg head, with the string feeding on to it would certainly obscure or interfere with the intricate design). Could the arrangements of pegs in even numbers be not so overwhelming if the vihuela and the guitar have evolved as having viol- or lute-type of peg heads and consequently had the exactly necessary (odd) numbers of pegs, as is shown for example on the six-course quinterna on plate XVI of Praetorius’s Sintagma Musicum(37)? There are still many questions to answer here but what is clear is that the attribution of the Belchior Dias instrument should largely be approached from an organological perspective. Naming it as a guitar by mere relation to the fact that the date of its manufacture coincides with the rise of the strumming style of playing the guitar c.1580 and simply ignoring the presence of the centrally-positioned peg hole is far from being satisfactory. The vihuela was still being made and played well into the first quarter of the 17th century. The documental sources published in the dictionary “The Vihuela de Mano and the Spanish Guitar” by Jose Romanillos and Marian Harris Winspear as well as examples of the vihuela music from the early 17th century which were analysed in details in John Griffiths’ report at the 1998 symposium in Paris witness this(38). 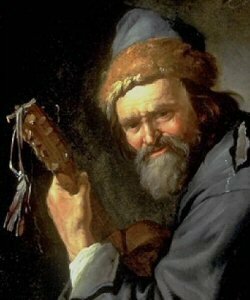 Besides, less than ten years separate the date of the Dias instrument’s manufacture from the publication of the Do Regimento dos Violeiros (Lisbon, 1572) which sets forth the guidelines for making a viola de seis ordes – a six-course vihuela(39). In addition, the evidence presented in this study clearly points out that the presence of odd numbers of pegs on peg heads of late 16th – early 17th century guitars and vihuelas was an inherent organological feature reflecting their constructional diversity. To what degree this evidence can influence the way the Belchior Dias instrument is attributed will remain, I suppose, a matter of personal choice. It seems though that unless an adherence to the ‘unoriginal’ nature of the central peg hole on the Dias is firmly held as the only cause of its origin (see the relevant discussion above), there is very little ground, if any, to justify the Belchior Dias instrument’s attribution to a five-course guitar rather than a six-course vihuela or, to use the above-mentioned Portuguese equivalent of this name, a six-course viola. 3 This instrument is on display at the collection of the Royal College of Music, London. 4 This rare guitar formerly belonged to Robert Spencer, now in possession of Frank Koonce, USA. 5 Provision of a pin for fastening a strap was most certainly anticipated by the maker in order to support the instrument’s rather heavy solid ebony neck. 7 For a description of this instrument see: Historic Musical Instruments in the Edinburgh University Collection, vol. 2, part B, fascicle ii, Edinburgh University Collection of Historic Musical Instruments, 2003 pp. 29, 30. A full-size drawing of the instrument is also available from the collection. 9 Unknown private collection. You can find the description and measurements of this guitar in: The Spanish Guitar, New York – Madrid, 1991 – 1992, pp. 115 – 117. See also an article by Laurence Libin: A remarkable guitar by Lorenzo Alonso, Early Music, November 1992, pp. 643 – 646. 10 As practical experience shows, however, it does not seem to be a problem to adapt to the closer spacing for players who use “thumb-over “ technique but for those with the “thumb-under” way of plucking it may take some time to accommodate to it. 11 For more detailed discussions of related matters see Antonio Corona-Alcalde, The Viola da Mano and the Vihuela, Evidence and Suggestions about their construction, The Lute, volume XXIV, pp. 22 – 24 and Some Reflections upon the Vihuela, Bermudo and other Sundry Matters, Lute Society of America Quarterly, Volume XXIV, No.3, August 1989, pp. 9 – 11. 12 There is a fair degree of similarity, for example, in the peg head outline of some of the guitars of the Voboam family of makers (notably Jean Voboam 1676 and 1687 guitars from the collection of the Cité de la Musique, Paris) with the Iberian c.1590 guitar (see note 5). 13 VMSG, op. cit., 480. 15 Both painting are from the collection of the Yamato Bunka-kan in Nara, Japan. 16 What is remarkable about this engraving is that it was most evidently completed before the painting was enlarged c. 1683 and, as a consequence, some of the details on it were changed, including the body of the guitar which now appears to have a flat type of back. Not so unusual perhaps: it had to conform to the tastes of Louis XIV, besides the French seem to have been favoring a flat-back model of la guitarra spagnuola throughout the 17th and 18th centuries! 17 . 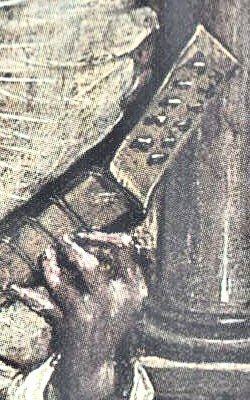 A rather fragmentary engraving in Granata’s third book Nuova Scelte Di Capricci Armonici… (1651) shows a deep bodied guitar with four pegs on one side of the peg head; so presumably it is also meant to be a nine-string guitar. 20 The painting is located in the Musée du Louvre, Paris. 22 Renato Meucci, Da ‘chitarra italiana’ a ‘chitarrone’: una nuova interpretazione; in Enrico Radesca da Foggia e il suo tempo Atti del Convegno di studi, Foggia 7-8 Aprile 2000, pp. 30 – 57. 24 For a more comprehensive description of the Quito vihuela see The Spanish Guitar, op. cit., 40 – 47. 25 Inv No E.30, Collection of the Cité de la Musique, Paris. 26 Inv No 5420. For a full description and photographs (including x-ray images of the body) see: Bettina Wackernagel: Europäische Zupf- und Streichinstrumente, Hackbretter und Äolsharfen, Deutsches Museum München, Musikinstrumentensammlung, Katalog, Verlag Ervin Bochinsky, 1997, pp. 78 – 81. 31 One other remarkable feature of the guitar depicted on the the Leonello Spada’s Concert (see note 17), for example, is the way the neck is shaped by gradually increasing in depth in the heel area at the join with the body. This could well be one of the features associated with the earlier, shallow-rib way of body construction of the four-course guitars and vihuelas, as is found in the three surviving examples: Jaquemart-Ándre vihuela and fluted-back instruments – Belchior Dias, 1581 and E. 0748 ‘Chambure’. 35 To the present day there are at least three surviving five-course guitars with a nine-peg arrangement on their peg heads: two on them are mentioned in note 18, one more guitar is in a private collection (Italy). 36 Examples of such ornamental designs can be seen on peg heads of some early representations of six-course vihuelas, for example in woodcut prints of L. Milan’s El Maestro (1534) and L. Venegas de Henestrosa’s Libro de cifra nueva para tecla, arpa y vihuela (1557). 38 See note 1 & 24 above. 39 This document appears on pp. 138, 139 of Livro dos Regimentos dos officials mecanicos… Ano. MDLxxij. I would like to express my sincere gratitude to John Griffiths for providing me with a copy of this source. This entry was posted in Historical research, THE VIHUELA. Bookmark the permalink.